﻿ How to Find Decision Makers of Companies from Tradeshow list? If you have a tradeshow members list or a list of companies to target, LeadGrabber MF helps you to find business contact information of CEOs, CTOs, CFOs, CIOs, CXOs, VPs, Directors, Founders, Owners, etc. and enables you to speed up the process of B2B sales prospecting. 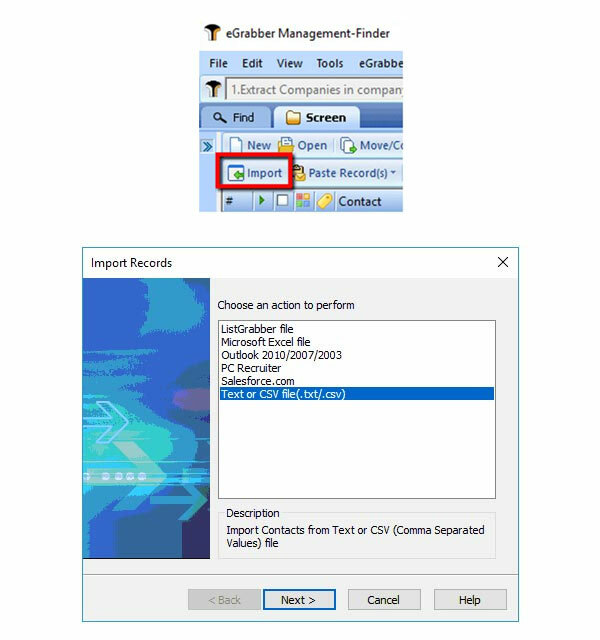 Step 1: Click on “Import” button on the LeadGrabber MF grid toolbar, select the Excel/CSV list, follow the instructions and click Finish. Note: LeadGrabber MF helps you to import lists from Salesforce.com, PCRecruiter, Text file and Microsoft Outlook. Step 2: Select the companies in the grid and select "*Append Matching Prospects in Companies" option from the LI Management Finder drop-down and click on the relevant decision maker title. Example: CXO Level - VP Level - Marketing. Step 3: LeadGrabber MF searches and finds decision maker names for the selected companies in the grid. Now, you have a list of Decision Makers with name and company name. Step 4: You can now find C-level executives’ business contact information such as verified work email address, phone numbers, LinkedIn ID, etc. Select the records in the grid and click Append Contact Info > Append Selected. Select the options that need to be found [Append Email / Phone / Postal Address / TimeZone]". LeadGrabber MF performs deep-web searches and quickly finds decision makers’ contact information. *LeadGrabber MF supports both LinkedIn Sales Navigator and Recruiter accounts.